There were hints of this somewhere a few months ago that negotiations were happening and they didn't seem to be going so well. I didn't want to believe it and thought, no they'll hash everything out. Now we have confirmation that Air Canada and Aeroplan will part ways in 2020! They didn't hash everything out although Aeroplan appears to want to continue to negotiate but Air Canada seems like they want to have their own program. Air Canada today announced its decision to launch its own loyalty program in 2020 upon the expiry of its commercial agreement with Aimia, the operator of Aeroplan. Effective June 30, 2020, Aeroplan will no longer be the loyalty program for Air Canada. Aeroplan has been independently owned and operated by Aimia for almost a decade. By operating its own loyalty program, Air Canada will be better able to strengthen its customer relationships and deliver a more consistent end-to-end customer experience. Aimia and Air Canada have been engaging in discussions and the tenor of the very recent discussions leads Aimia to the belief that Air Canada does not currently intend to renew its partnership with Aeroplan on its expiry in June 2020. The existing agreement and Air Canada's purchasing commitments to Aimia remain in place until June of 2020. Aimia strongly believes that a renewal of the company's long-term partnership would be the best and least disruptive option for both companies' customers, in particular Air Canada's frequent flyers. While Aimia remains open to further discussions with Air Canada, the company's strategic planning had already contemplated other post-2020 alternatives in parallel with the goal of ensuring that Aeroplan members retain access to a strong redemption offering around air rewards in the future. Given the state of current discussions, we will continue to pursue these alternatives actively. This is one thing I'm sure Canadians never expected. I mean Aeroplan was one of the very first loyalty programs in Canada and it was launched by Air Canada as a true frequent flyer program. It was later on when Air Canada spun it off as a separate entity that we saw Aeroplan grow into what it is today, a coalition program for Canadians as they challenged AIR MILES for the retail loyalty space. It was that spinning off as a separate company that also put Aeroplan in this position. Air Canada has their elite recognition program, Altitude, which seems like it will be developed into the new loyalty program. Whether it will have a brand new name and or not we don't know. 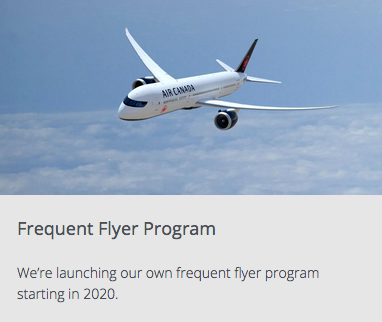 That doesn't really matter though as current or future up to 2020 Altitude members will have their status (including life time status) brought over to the new program. Aeroplan miles earned up to June 2020 will stay in Aeroplan members' accounts, and will continue to be subject to the conditions of their program. The airline's most frequent flyers will continue to enjoy Air Canada Altitude status recognition and its associated range of travel privileges, based on their annual flight activities with Air Canada and the Star Alliance member airlines. All Million Mile program qualification activity and status will also be honoured in the new program. Air Canada intends to implement near-term improvements to Air Canada Altitude and other elements of the customer experience. Will Aeroplan have access to Star Alliance members award inventory or will that become exclusive to Air Canada's new program? If not then Aeroplan will have to start negotiating separate agreements with any other potential airlines they want to have partnerships. Technically speaking, Aeroplan could approach WestJet and become a partner, just like AIR MILES has both airlines. Highly doubtful but possible. What will TD think? They just spent a crap load of money to become the primary bank issuing Aeroplan credit cards and they'll likely see an exodus of cardholders in three years. I'm guessing TD's already seeing how they can win the RFP for the new Air Canada program. I can't say that I'm 100% surprised this happened. Aeroplan used to be Air Canada's Frequent Flyer program but then became a coalition program and really lost its way as a frequent flyer program. While it was industry leading when it was spun off, and several other airlines followed suit by spinning off their loyalty programs, it meant the program went away from what it was originally designed to do, reward loyalty for flying on that airline. The new Air Canada program will do that. I envision a throwback to the original frequent flyer model. You'll earn miles for travel related actions (Flights, hotels, car rentals) and credit card spend. 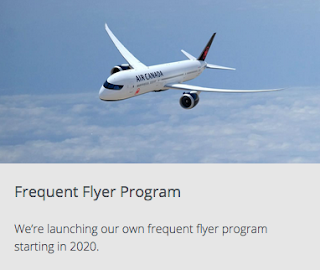 Chances are Air Canada's new program will not be getting into the shopping/retail market seeing that Aeroplan, AIR MILES, More Rewards, SCENE and hosts of other programs already compete for that space. Air Canada will likely make the program very lucrative to start, not to steal away Aeroplan customers but to bring back flyers they have lost to programs like British Airways Executive Club, Alaska Airlines Mileage Plan, United MileagePlus and others. This will be a new marketing tool for Air Canada to encourage people to come back and fly AC over other airlines as Aeroplan does not do that for them right now. In many ways this is good news for Canadians. The marketplace will become more competitive, especially for credit card sign up offers and we all know that outside of being a frequent traveller, credit card sign ups and spend are the easiest way to accumulate those rewards! What will likely be the bad part for Canadians is those who have huge Aeroplan balances if they lose access to Star Alliance flights. Yes you can redeem on Air Canada but you'll be stuck paying exorbitant fees on many of those flights! What are everyone's thoughts? Is this good news? Bad news? What do you see happening? We encourage you to start the discussion in the comments section below.